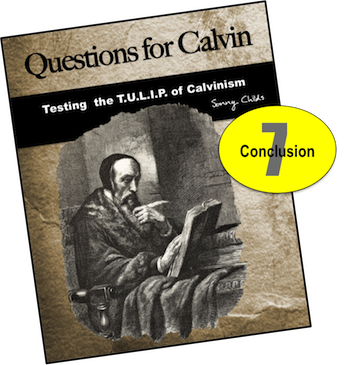 Q: Are Calvinists saved or lost? A: In truth, even they aren't sure. "I write these things to you who believe in the name of the Son of God so that you may know that you have eternal life. This is the confidence we have in approaching God…"
"'Do not work for food that spoils, but for food that endures to eternal life, which the Son of Man will give you. For on him God the Father has placed his seal of approval. Then they asked him, 'What must we do to do the works God requires? Jesus answered, “The work of God is this: to believe in the one he has sent.'" Please notice that John, the inspired best friend of Jesus, confirms that our salvation confidence is directly dependent upon our system of belief. In the second passage, notice that the inspired Son of God confirms that our belief is a work. This divine teaching of confidence based upon the work of belief presents a very troubling conflict for the Calvinistic doctrine. As we have already seen quite vividly, Calvinists believe that God is responsible for all parts of our salvation process. Humans are little more than pawns on the grand chessboard of Heaven. To claim that we are required to do any level of work is to claim that we are saving ourselves. Because we are totally depraved without even the ability to choose God, the natural conclusion is this. Those who are saved arrive at that condition by being unconditionally elected to respond to an irresistible grace that leads to a God-manipulated state of "once saved always saved." Salvation comes not by a freewill choice to respond to the Savior and thus find confidence, it comes by a pre-determination known only in the heart of God. Because this pre-determination is totally divorced from our influence, a conclusion that we are saved is not based upon personal knowledge but rather upon uncertain hopeful assumptions. Does that sound like the certain knowledge of 1 John 5:13 to you ("...so that you may know that you have eternal life. ", NIV)? Does anyone else find it odd that God would take such pride in creating us in His image yet, according to Calvin, do so without the creative nature to choose our own destiny? According to Jesus, belief is a work (John 6:27-29). More specifically, belief is a work that is required by God (vs 28) in order to choose "eternal life" (vs 27). According to Calvin, God pre-determines who gets salvation without any influence from mankind. How can these two doctrines possibly coexist? To whom are we going to listen, the Christ or the Calvinist? 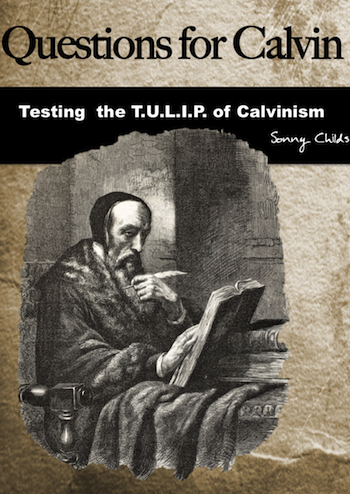 Back to our question: "Are Calvinists saved or lost?" In addition to dismissing the words of John and Jesus, the doctrines of Calvin also force believers to engage in selective obedience in order to hold on to Calvin's conclusions. Because he assumed that mankind is totally depraved and therefore without any responsibility in the salvation process, all passages commanding personal effort must be reduced to optional, post-salvation suggestions not requirements for the forgiveness of sins. Allow me to offer just one very powerful example. On the opening day of the church, during the inaugural sermon of Peter, it was the Holy Spirit Who gives a rather direct answer to the question of man's involvement in the conversion process. After learning they had killed the Son of God, the panicked crowd cried out "What should we do?" Notice the two inspired instructions they were given: First, they were invited to make the freewill choice to engage in the efforts of repentance and baptism. Secondly, they were specifically instructed to take these steps "for the remission of sins." The express purpose of their effort was to take away their sins. It was not to add them to a congregation's membership role. It was not to make a public relations statement that they had been saved prior to repentance and baptism. It was not commanded as an "outward sign of an inward grace." Repentance and baptism were commanded for the purpose of forgiving sins. To the Calvinist, this passage has to be one of the most feared, most avoided passages in all the Bible. The only way to fully embrace the explicit instructions of Peter is to acknowledge that mankind is required by God to do something in order to have their sins forgiven. That conclusion simply cannot stand within the value system of a Calvinist. It completely undermines the entire foundation of the T.U.L.I.P. Choosing to repent and be baptized "for the remission of sins" means that a person is not so fully depraved as to be totally without the ability to choose God. This biblical principle undermines the T in Calvin's doctrine, "Total Depravity." It forces a Calvinist to either engage in selective obedience or abandon Calvin and return to the whole counsel of God. Choosing to repent and be baptized "for the remission of sins" means that a person's election is not unconditional. This biblical principle undermines the U in Calvin's doctrine, "Unconditional Election." It forces a Calvinist to either engage in selective obedience or abandon Calvin and return to the whole counsel of God. Choosing to repent and be baptized "for the remission of sins" means that atonement is not limited but rather open to all. Read the context of Acts 2. This biblical principle undermines the L in Calvin's doctrine, "Limited Atonement." It forces a Calvinist to either engage in selective obedience or abandon Calvin and return to the whole counsel of God. Choosing to repent and be baptized "for the remission of sins" means that grace can be resisted by simply ignoring these commands. This biblical principle undermines the I in Calvin's doctrine, "Irresistible Grace." It forces a Calvinist to either engage in selective obedience or abandon Calvin and return to the whole counsel of God. And finally, choosing to repent and be baptized "for the remission of sins" implies that the perseverance of the saints begins and is maintained by freewill choice. This biblical principle undermines the P in Calvin's doctrine, "Perseverance of the Saints." It forces a Calvinist to either engage in selective obedience or abandon Calvin and return to the whole counsel of God. In order for Calvin's T.U.L.I.P. to be valid, the biblical freewill choice to repent and be baptized "for the remission of sins" cannot be valid. A choice must be made. To whom are we going to listen, the Christ or the Calvinist? Eternity is too long and salvation is too precious for us to go through life without complete confidence in our conversion process. The only way to have this confidence is to throw off the doctrines of men and fully embrace the commandments of Christ. As we conclude this important series, allow me to give you one last important admonition. It must be remembered that Calvinism is not a specific Christian denomination. It is, rather, a cancerous indoctrination that permeates nearly every Christian denomination. "An outward sign of an inward grace," "the sinner's prayer," "original sin," "once saved always saved" - these are the phrases common to a fellowship influenced by Calvin. If these teachings are common to your fellowship, please be warned! While Calvinism often spins its old doctrines with fresh titles, such as “New Calvinism,” “Covenant Theology” or “Reformed Theology,” the reality is this, reformed anything is only at best a partial fix. By definition, reformation does not seek the original, it only seeks a redressing of the original. To fully embrace God’s will, we must restore full submission to the original revelation, to the whole counsel of God. In a world so devoid of personal responsibility, Calvin's doctrine of grace without responsibility is truly alluring. But may we never forget the following warning from God. "For the time will come when people will not put up with sound doctrine. Instead, to suit their own desires, they will gather around them a great number of teachers to say what their itching ears want to hear. They will turn their ears away from the truth and turn aside to myths. But you, keep your head in all situations…." So, here is our challenge. We must focus on God not man. We must uproot human doctrines like the T.U.L.I.P. We must not be so anxious to bask in grace that we build our house upon the sand. We must embrace the whole counsel of God. Remember, we cannot save ourselves, but we can accept a Savior. We must do "the works God requires" (John 6:28, NIV). We must make it real! I firmly believe that two of the greatest challenges facing the church today are Islam from without and Calvinism from within. In a world so devoid of personal responsibility, Calvin's doctrine of grace without responsibility is truly alluring. Young people are deserting biblical truth in alarming numbers. These false doctrines have permeated nearly every Christian denomination and must be addressed. Our children are at risk. It is my greatest prayer that you will find this information helpful in defending them against the false teachings of Calvinism. Back to Top of "Questions for Calvin"